You may have seen infomercials on television (As Seen On TV) recently touting the Power Pressure Cooker XL. Naturally, the manufacturer presents this kitchen appliance as the be-all and end-all of kitchen gadgets. How true are manufacturer’s claims? 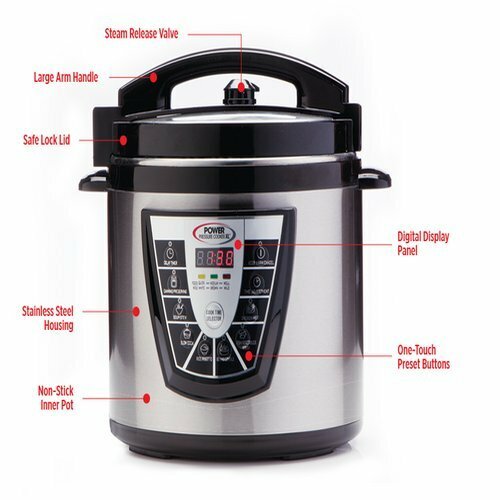 In this power pressure cooker review, we will compare and contrast this information. What Does The Manufacturer Promise? What Do Purchasers Actually Say About The Pressure Cooker XL? Does The XL Work As Promised? The Power Pressure Cooker XL is presented as a handy appliance to use for preparing your favorite dishes as much as 70% faster than using conventional cooking methods. The appliance has one-touch controls and is available in three sizes: 6 quart, 8 quart and 10 quart. Because the XL uses less energy than other appliances and produces better results (use the least expensive cuts of meat and attain tender, mouthwatering results) it is presented as enabling you to save a great deal of money. Additionally, the m﻿anufacturer claims that you can use this appliance to can your own fresh fruits and vegetables in season. This means improved food quality and savings for you. Cleanup is presented as being easy thanks to the removable, dishwasher safe inner pot. The manufacturers claim that the pressure cooker is very convenient because being able to cook all of your ingredients in a single pot is time-saving, and the pot is quick and easy to clean. Digital settings allow you to time your cooking perfectly so that when the cook time is over, the pressure cooker switches to a convenient keep-warm mode until you are ready to eat. While they are constantly changing offers to entice new buyers, here are some things to consider at the time this review was written. You may gain access to a wide variety of recipes, and special bonuses including actual hard copy books that tell you how you can use your new pressure cooker for canning. The Power Pressure Cooker XL is presented as an affordable addition to your kitchen in various sizes. What's the difference between the 6 Quart and the 6 Quart Power Pressure Cooker Pro? We thought they should have been included in the basic model. It's important to understand how a pressure cooker works. Similar to a microwave, pressure cookers use the heat of steam to cook. Unlike a microwave, they do not use atomic energy! Instead, a pressure cooker traps superheated steam using a technology called flavor infusion. This forces moisture into the food being cooked and locks in the flavor and the nutrients. This method has the potential to work well with all kinds of foods including meats, poultry, fish and veggies. It also cooks one pot dishes such as stew, beans and rice. The bottom line is that the infomercial makes the Power Pressure Cooker XL seemed to be an extremely valuable product. It may be a valuable addition to your kitchen if you can avoid the hassle that seems to come along with an online purchase.